Rosacea is a skin disorder that affects primarily the facial skin. Usually, it makes its appearance in the form of redness on forehead, nose, cheeks and chin after one enters the fourth decade of life. Some people may also find it on their scalp, ears, neck and the chest. First off, you have to eliminate the possibility of having any other condition. How to go about it. Rosacea looks like acne. Now there are 3 visible symptoms which are pustules or red pimples, enhanced flushing & dilated blood vessels. If you have these 3 symptoms, you have rosacea. Hence, if there are only dilated blood vessels and no acne or flushing, it is a not rosacea. These vessels may have got damaged by trauma, surgery or photodamage. Yes, if you are under stress or going through bouts of anxiety, rosacea may get triggered. It is really difficult to control such emotions as they are sudden and come uninvited. Try some relaxation techniques, especially if its stress. Yoga, and deep breathing are big time relievers. In fact anything that relaxes your mind and body will bring in relaxation in the frequency of flare ups. Some foods too have the capability to trigger rosacea. These include chocolate, dairy, vanilla, vinegar, soy sauce, tomatoes, bananas, eggplant and avocados. In fact, some beverages too - champagne, grin, beer, red wine, vodka and bourbon including some drinks like, coffee, tea and chocolate. Substitute them with herbal teas. Often the kind of products we use can cause havoc. Hence you must ensure you are not using the wrong products. So, if one feels a stinging sensation or it burns the skin, or causes redness its time to change them. These products may be containing alcohol, fragrance or witch hazel. Move them out of your skincare regime. Experts advise against usage of astringents, toners, scrubs, alpha hydroxy acids and retinoids. Skin of rosacea afflicted people is sensitive and hence should use products designed especially for their skin. These may not give you complete relief, but are surely going to help you get over the pain and agony. Cucumbers give relief from redness and the burning sensation you feel along with it. There is no scientific evidence for it, but people have been using it and finding huge relief. A natural remedy and a great reliever in getting rid of redness and itching. It absorbs oil and moisturizes the skin at the same time. The list is long but worth knowing - caffeine, alcohol, processed foods, sugar, dairy products, fried foods, hydrogenated oils, trans fats and anything that can result in allergies. Avoid them, avoid rosacea. 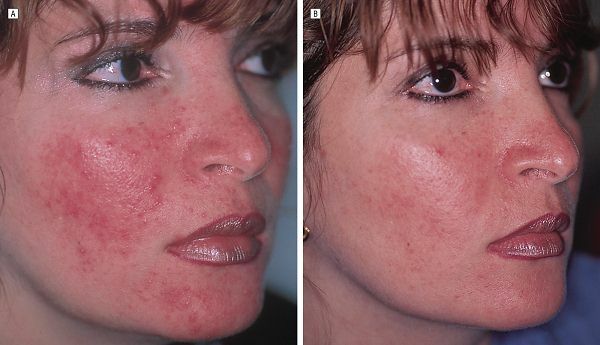 When there are only a few pimples around the central part of the face, only a slight redness and lightly dilated blood vessels, this is mild rosacea. A few lifestyle changes and topical products are sufficient to get over these triggers. A topical Revitol rosacea treatment cream can help get over rosacea within 8-to-10 days. Your Dermatologist may ask you to use it for an year, follow his instructions. It ensures rosacea doesn't strike back. You know what effect it will have on your face - all flushed with acne and dilated blood vessels and flushing. Some people tend to have painful cysts and swollen cheeks. Cure it immediately. The first thing it works against are the pimples. After the antibiotics are given.